This is the ultimate gift for any designer on the go. The Apple MacBook Pro is the perfect laptop for designers because it can handle running multiple design programs at once with ease. It sleek design, powerful hardware and easy to use operating system will make any designer eternally grateful! Wacomâ€™s Cintiq 21UX interactive pen display combines the benefits of using an LCD screen with the precise control and comfort of Wacomâ€™s most sophisticated tablet technology. Using the tablet pen directly on the screen lets you work more naturally than using a separate tablet pad and pen. The AdobeÂ® Creative SuiteÂ® 3 Design Premium software is essential for graphic designers. It has every piece of software required for graphic designers to function as professionals in their industry. Below is a list of all the software that comes in this package. Thanks Adobe! The Intuos3 9×12 is a great gift for designers and illustrators because it makes creating artwork on screen much easier then with a traditional mouse and keyboard. Artists can use the pressure sensitive pen on the 9×12 pad to create stunning artwork comfortably and easily. Other sizes available. 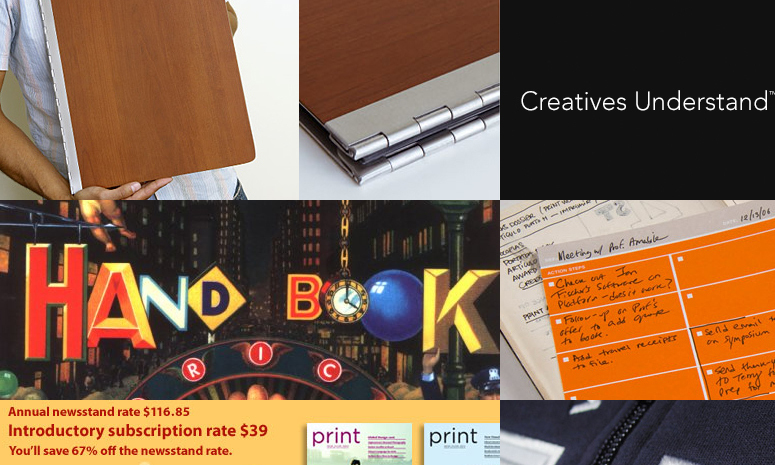 This wood grain portfolio is a great way to show off your work in style. A strong screw-post binding holds the 11″ x 14″ pages in place, with 10 included with the portfolio. You can order more pages if needed and they also have a protective case for sale. Donâ€™t forget to check out their aluminum version of this portfolio if thatâ€™s more your style. This soft navy blue fleece is the perfect light weight jacket for those fall days and just in case you ever need to explain to some one what kerning is your handy jacket will become the perfect live demo. The letter is in News Gothic Bold and the jacket comes in many sizes. Itâ€™s a very hot item this Christmas so get it before its gone! A flash drive is one of the most useful items a designer can have. This one is reasonably priced and gives you 4 gigs of storage! The Cruzer Micro comes preloaded with synchronization, password-protection and antivirus software. Print magazine is a great gift for any designer. The subscription is for 6 issues filled with content on visual culture and design sure to delight and enlighten any designer. The colors in this Pantone Formula Guide are based on the most requested Pantone Colors by designers. This booklet is the perfect color guide for designers and contains 1,114 spot Pantone Colors! This is the ultimate handbook for design professionals looking to enter the business world. It is filled with useful information to guide and protect designers. This high quality shirt from Veer speaks for itself. Creatives Understand. The Action Pad Mini was designed by the Behance team and is the ultimate note taking and brain storming note pad around. It lets designers easily organize and plan out projects on a small notepad that is easy to carry around.